We know, there are days you just want to cover your face, and not face the world. Big pimple. Melasma. Scars. Wrinkles. Over-oily skin. Dry complexion. Etc. Okay, maybe we can't eradicate everything perfectly, but a great beauty mask can deliver the goods! A mask is a very useful beauty treatment. First, you don't need a lot of time to have a mask go to work. Second, a beauty mask can help cover, or 'mask' some of your imperfections, at least for a few hours. Let's say you have an important and major event to attend, and your skin is looking dull and tired. Give your complexion an instant boost with a mask. And we ain't talking an egg white mask that your moms and grandmoms used to use (although that's a decent, natural mask). Today's beauty masks, are made of more sophisticated formulas. Active ingredients that are more intense in a very brief time. 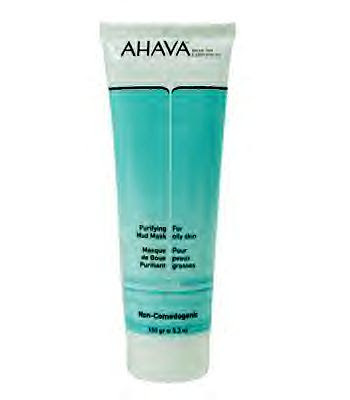 Ahava Source Purifying Mud Mask ($28, thecosmeticmarket.com). Made with Dead Sea purifying minerals. Acts quickly--just 2 minutes to stamp out grime, clear blackheads, and dry up oily skin and blemishes. 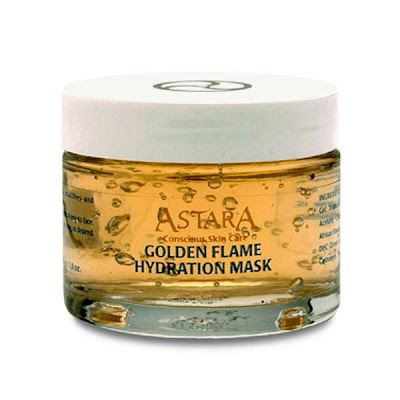 Astara Golden Flame Hydration Mask ($14, secure.earthsaversonline.com). Formulated with a special, natural element that retains moisture in the cells. Enhanced with aloe vera gel and refining cucumber extract. Skin plumps up and fine lines appear diminished. Smurf lovers, and you know who you are, ladies? Children of the 1980's, gather round. So Smurfy Eyeshadow Collection ($32.50, sephora.com). Not for the kiddies, but for girls who like to have fun, want some really pretty and blendable eyeshadow shades, and love Smurf-chic!! This makeup by Too-Faced, is not childish in the least. The 4 colors are quite sophisticated. The shadows are highly pigmented, and very wearable. And the good news: crease-resistant and soft as velvet. 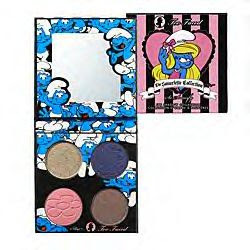 If you are a serious Smurf buff, then you might want to pick up 2 of these So Smurfy Eyeshadow Collections. One to definitely wear. And the other to keep as a collector's item. We receive personal emails at times, and many of you request the perfect skin care regimen. The one 'hope in a jar' cure for wrinkles, pimples, sun damage, and more. We wish we had the universal answer. We long for the one little bottle that can erase our complexion problems, too. Let's face it. We all have skin issues. Some treatments work great for us, while the same jar won't do anything for you. You've got to experiment and really 'listen' to your skin. In other words, learn about your texture, your tone, your blemishes, and where your fine lines like to set up house. And then, attack!!! Yes. Battle your enemies with beauty products that target your wrinkles, your pimples, your fine lines. This little serum in a bottle is powerful, and yet gentle to your complexion. It exfoliates, but not with the typical AHAs or alpha hydroxy acids. We love the AHAs, but they can leave us with red, swollen skin. Peeling Groovy is made with sensitive skin in mind. That means the formula is kind to your complexion. 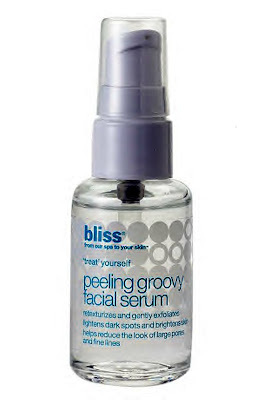 Instead of AHAs, Bliss' Peeling Groovy contains moisture-magnetizing AFAs (filaggrin-based amino acid antioxidants). From one of the top spa destinations comes a collection of skincare, suncare, bath and body products for women and men. Behind Bliss's witty names and simple designs are serious, science-based formulas that protect, repair, relax and recharge. Let's be honest here. We are a culture of 'instant results.' We don't like waiting patiently for good things to occur. We want things immediately! ASAP!! And that's why plastic surgery is constantly adapting to the way people think in the new millennium. Non-invasive procedures like Botox and Restylane are extremely popular. So is SmartLipo. And the brief down-time of Mini Face-Lifts. And so on. And now in 2009----UltraShape. Another non-invasive way to get slim instantly! A walk in--walk out procedure. Small target areas of fat are zapped by the clever technology of ultra-sound energy. This results in smoother and uniform contouring. There's just one tiny problem---UltraShape is almost here, but not yet approved for use in the United States. Many women and men have flocked to Canada to have the slimming procedure done. However, it looks like 2009 will be the year UltraShape gets the thumbs up here in the U.S. If you have many pounds to get rid of, then UltraShape is not for you. But if you have key fat zones you would like to melt away, like saddlebags and love handles, and a too-big tummy, then you can lie down on the table for a non-invasive, safe, and painless way to get skinny. Look at the before & after photos. These pics are from the gallery at www.ultrashape.com. You can see the so-called saddlebags or extra fat removed from the outer thigh area. And quite dramatically, we might add. The results in the after photo were obtained following 3 treatments. The UltraShape CONTOUR I uses a patented ultrasonic transducer to deliver controlled focused ultrasound at a precise depth within the subcutaneous tissue and is designed to target and disrupt only adipose tissue, leaving surrounding structures such as skin, blood vessels, nerves and connective tissue intact. The UltraShape way to go, will cost you anywhere from $400 to $1,000 per treatment. The procedure does not require anesthesia, and lasts anywhere from one hour to one and a half hours. Okay, you have a choice. It's either a grapefruit or banana. Choose the one that tastes better to you, because you are going to be seeing that lovely piece of fruit for quite a time now, if you choose to follow one of these proven weight loss diet plans. It's already the beginning of 2009. It's a new year, and so many women and men have high hopes of shedding pounds. Sure, there are tons of diet plans out there. Some work, and sadly, some do not. We are offering you 2 weight loss plans. There are no gimmicks here. Both diets are safe and healthy. Eat a little grapefruit before every meal. Very simple diet plan. According to the Journal of Medicine Food, half a grapefruit before meals can help you lose about 4 lbs. in 12 weeks. 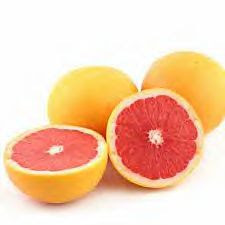 A grapefruit is full of fiber, only 100 Calories, about 23 Carbs. and low in sodium, and high in potassium. A grapefruit has a 65% water content. The fruit's fiber and water helps fill you up, so you eat less. So rather than indulging in a soup or salad, try eating half a grapefruit before your main course. "The Morning Banana Diet consists of one or more bananas with room-temperature water for breakfast; an optional snack at 3 p.m.; and anything you want for lunch and dinner. The catch: You can't eat desserts after meals, dinner has to be consumed by 8 p.m. , and you have to go to bed by midnight." Bananas are rich in potassium. But the yellow, creamy 100 Calorie treat is much more than that. Packed with fiber, iron, and protein, Vitamins B6 and C.
And Bananas also stop your craving for sugar. And the fruit is high in minerals that reduce cholesterol. And they are great for pregnant women, because they contain good things that help keep blood sugars up. There you have it---two intelligent weight loss plans for the new year. Healthy and safe. If there's an expert on fake tresses, well, Britney Spears could probably write a book about all kinds of hair---the good, the bad, and the ugly. The 27-year-old pop princess is ready to launch a 're-extension' of her recent fabulous comeback with her own line of hair extensions. Ever since the pretty performer shaved her head in February 2007, she's been sporting weaves, wigs, and extensions in just about every color, style, and length. And we hear she's been consulting with celebrity stylist Kim Vo on how to market the perfect faux tresses this year in 2009. It's been a long 2 years of trying to grow out her almost bald buzz cut. 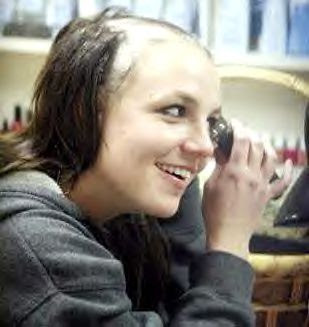 And in that time, Britney Spears has become an expert in everything hair. And if she decides to launch her own hair extension line, we applaud her. It's been a tough road trying to regain her gorgeous, long blonde locks. As you can see in the photo above, taken just a few weeks ago, the platinum and perfect tresses are back. Okay, those are partly extensions, but what Hollywood hottie doesn't wear them at least once in a while. Jessica Simpson. Paris Hilton. Raquel Welch. These famous celebrities all market their own hair extension lines, and they are proud users as well. And so many women opt for fake tresses these days, even the girl-next-door. What's not to love? With hair extensions, a girl can go instantly from short, fine hair to thick, wavy or curly long locks. You want the perfect hair shade, you can get it with extensions. Of course, human hair extensions are better than synthetic hair extensions because they look most natural and blend in better with your own real hair. With human hair extensions, you can curl them with heat, flat-iron them, and even chemically-treat these real, fake tresses with hair color, bleach, and perms. With synthetic hair extensions, you are more limited in what you can do, however, when it comes to bad weather like rain and high humidity, the synthetic extensions hold up better. These strands have memory. Human hair extensions will droop like real hair in the bad weather. We think hair extensions are a clever creation for women everywhere. And the sky's the limit on colors, textures, and lengths. What woman hasn't had a bad hair day?! It's nice to know that women next door can achieve a beautiful, crowning glory just like the women who walk the red carpet in Hollywood. We'll be looking out for Britney Spears' own hair extension line. It's been the buzz around salons. She's kind to animals and recently wed radio superstar Howard Stern. Beth O. also revealed one of her favorite beauty tips. One that leaves you stocking-free all year round!!! Everyone's heard of Sally Hansen's Airbrush Legs ($13.99, at drugstores). We have many girlfriends who detest wearing pantyhose, even in the cold and brutal winter air of the northeast. But ladies, why not try Mrs. Howard Stern's method? Beth Ostrosky applies Sally Hansen Airbrush Legs for an instant glow and silky smooth legs. The spray-on pantyhose comes in 4 blendable shades: light glow. medium glow. tan glow. deep glow. The spray won't cover imperfections like spider veins completely, but the beauty product does minimize bothersome leg issues. Plus the formula is water-resistant, weightless, and moisturizing with Vitamin K.
We have used the spray in medium glow. It gives a lovely sheen with a nice shade of a light tan. The color is pretty. It isn't an orange streaky hue. The only advice we will give---spray the formula directly into your hands and apply to your legs, and take a cosmetic sponge to blend quickly. And then, don't sit on anything for about 5 minutes. Let it dry completely. A lot of women have been complaining to Sally Hansen to fix the current nozzle on the Airbrush Legs can. It gets stuck after just a few uses, and it's sometimes hard to get the spray to, er, spray again. Beth O. likes the Sally Hansen Airbrush Legs beauty product because the formula delivers a flawless and healthy look to legs. Also makes legs look slimmer. And consider the feeling of absolute freedom from pantyhose!! Easy to remove with soap and water and a washcloth. Thanks for the beauty tip, Beth O. Happy New Year!